The first type of material that a prospective buyer needs to know is wood siding. This is the highest of maintenance siding because it requires painting and caulking so that it can remain looking good and functional. Whether you paint it, stain it, or finish it, wood will always require the most maintenance to look and work well. Furthermore, wood is easily damaged by insects, rot, splitting and warping. The second most common material is aluminum siding which requires lesser maintenance. It has a metallic finish, and is priced moderately. On the downside, it produces more noise than most other siding materials during the rain or gusty winds. Replacing the aluminum siding is a rather simple task if it is just a single panel or two, but is generally more expensive than wood siding, unless the wood is finished or stained. Lastly, if it is painted it will be relatively easy to match the colors exactly. The most popular type of siding is vinyl siding. It is the most popular due to the extensive benefits such as durability against the elements such as wind, rain, and degradation. Unlike wood it does not decay or get attacked by termites. It also does not require painting such as the one wood and aluminum require for it is generally cleaned when it rains. Furthermore, it is easier to replace even though it might be challenging to exactly match the repaired sections. requires low maintenance and it is made using recyclable materials. This is important especially when it comes to maintaining the environment. Additionally, it does not rot or get attacked by insects. But you can expect to pay about 5% to 14% more in material and installation costs when doing complex installation configurations and patterns. In the event that your siding becomes damaged, a panel or two may need to be replaced or repaired before the rest of the home. Depending on what type material and the color or finish of the material will determine the extend of repairing costs. Wood repairs are by far the most difficult to color and appearance match, whereas the vinyl siding is the easiest as it is commonly replaced and mass produced. 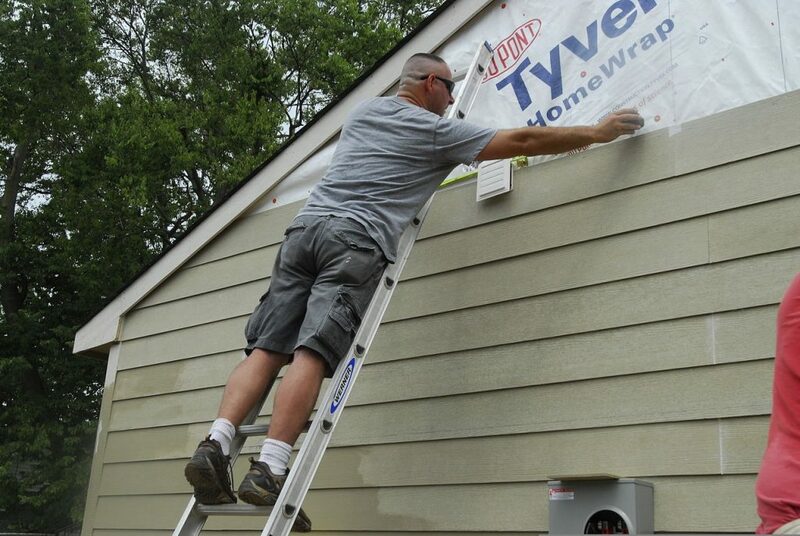 The majority of window or siding contractors will install and replace the building papers such as Tyvak when repairing or replacing the siding. When installing or replacing siding, many homeowners try to keep an extra slab or two of whatever material is used to finish their home. If you have the remaining siding from the original installation you can use them for replacement. These will almost exactly match the color an appearance minus whatever UV degradation may have occurred (usually minimal). costs. In conclusion, save any matching material from original or additional installation. And make sure you understand a complete breakdown of the costs associated with the full installation job.